I would like to understand what are the differences/advantages in using TF-IDF or the Log Entropy model for represeting documents and queries in an information retrieval system using diferent weights. I've tested both of them and computed the recall and precision metrics and I've obtained very similar metrics in both of them. The Log Entropy model has shown a little improvement in precision. For the development of this IR I've used the TF-IDF and Log Entropy models of the Gensim library and I've implemented the TF model based on the TF-IDF. The first global weighting function we considered normalized each word using the local weighting function, the second was an inverse docu- ment frequency measure, and the third global was an entropy measure. More details are provided by Pincombe (2004). The results of these analyses are shown in Figure 4. It is clear that altering the local weighting function makes relatively little difference but that changing the global weighting function does make a difference. Entropy global weighting is generally superior to normalized weighting, and both are better than the inverse document frequency function. For the 50 document corpus, performance is best when there is no dimensionality reduction in the representation (i.e., when all 50 factors are used thus reducing LSA to a weighted vector space model). Peak perfor- mance for the extended 364 document corpus is better and is achieved when between 100 and 200 factors are used. 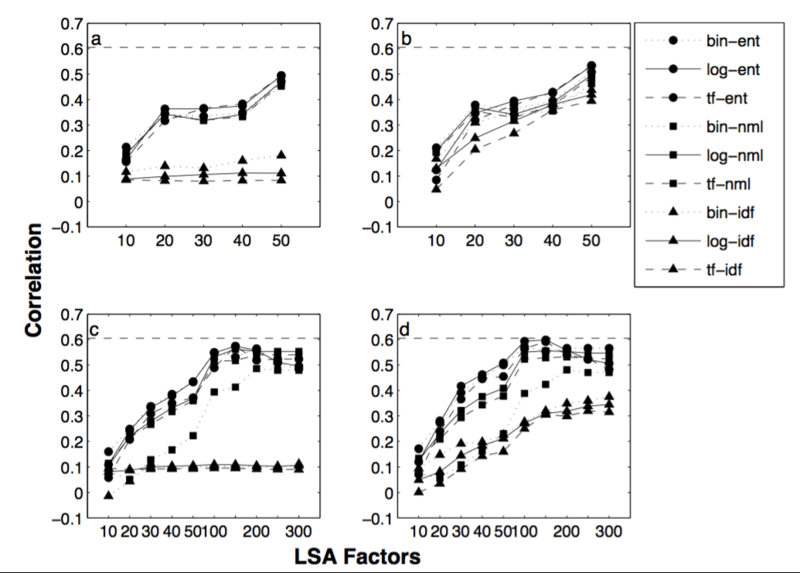 Figure 4: Correlations between the human similarity measures and nine LSA similarity models, for each of four situations corresponding to (a) the 50 document corpus; (b) the 50 document without stopwords; (c) the 364 document corpus; (b) the 364 document without stopwords. The nine similarity models consider every pairing of the binary (‘bin’), logarithmic (‘log’) and term frequency (‘tf’) local weighting functions with the entropy (‘ent’), normalized (‘nml’) and inverse document frequency (‘idf’) global weighting functions. The dashed lines shows the inter-rater correlation. Overall, the two best correlations with human judgements of pairwise document similarity are achieved using log-entropy weighting on stopped and backgrounded text. This is consistent with the literature where log-entropy weighting has performed best in information recall (Dumais, 1991) and text categorisation (Nakov et al., 2001). More controversial are the relative performances of the normal and idf global weighting schemes. The results showed that the use of idf as the global-weight produced correlations with human pairwise judgements that were uniformly worse than those achieved using entropy or normal global-weights in similar situations. In an information recall study (Dumais, 1991) idf weighting outperformed normal weighting. The same is true for most local weighting schemes in a text identification study (Nakov et al., 2001) although this ordering of global weighting function performance did occur for term-frequency local weighting. The choice of the global weighting function affects the correlations more than any other characteristic. The use of idf global weighting produces correlations with human pairwise judgments that are uniformly worse than those achieved using entropy or normal global-weights in similar situations. Variations in global weights have much more effect on the level of correlation with human pairwise judgments than do variations in local weights. So it appears log-entropy seems to work better information retrieval tasks, while you might want rely on TF-IDF for the more semantics-heavy information extraction/classification tasks where you will be using far more features. That being said, the TF-IDF measure has many knobs to tune (Sublinear TF and DFs or not? - see Nakov et al., 2001 Weight functions impact on LSA performance) and your results with TF-IDF will vary greatly with respect to the exact implementation. Overall, I'd say it makes intrinsically sense that log(TF)-Entropy should perform best, given that (the probability-based) entropy captures more "information" about the term across your documents than (the "binary") DF does. Not the answer you're looking for? Browse other questions tagged natural-language information-retrieval nltk tf-idf or ask your own question.